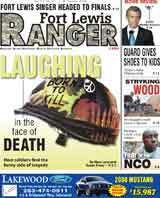 Fort Lewis Soldier in China? A Fort Lewis soldier captured in Korea and buried in China? Click here. We already sent our paper to press when this story on I Corps setting up shop in Japan released - here it is at Stars & Stripes. The Tacoma Tide FC beat a combined military team last night in UP. Click here for pics and the story. NELLIS AIR FORCE BASE, Nev. - The chairman of the Joint Chiefs of Staff landed at the start of a four-day tour of western-U.S. military installations. Navy Adm. Mike Mullen will visit airmen here and at Creech Air Force Base, about 50 miles northwest of here, and McChord Air Force Base, Wash. He also will travel to visit Marines and sailors at the Marine Corps Air Ground Combat Center, Twentynine Palms, Calif., and soldiers and family members at Fort Lewis, Wash. Although this trip has been planned for some time, this will be the first opportunity for the chairman to talk with airmen face-to-face since the June 6 resignations of Air Force Secretary Michael W. Wynne and Air Force Chief of Staff Gen. T. Michael Moseley. This is Mullen's first visit to each of these installations as part of the his overall effort to reach out to many of the of the U.S. military bases, but officials expect the topic of the resignations to surface during the "all-hands" meetings scheduled with hundreds of airmen. In a Pentagon channel interview last week, Mullen said he had great admiration for Moseley and Wynne, and, while he conceded the service faces some challenges in revamping its nuclear mission, he praised the work of Air Force members. "Airmen are really making a difference. They're in this global fight. They're pressing hard against the terrorists, (and) they've made a big difference in so many places," Mullen said. Today, the chairman received mostly operational briefings from senior officers at Creech Air Force Base. The sensitive briefings were closed to the media. Creech is home to DoD's joint unmanned aircraft systems center of excellence, which oversees the use of sensors and intelligence gathering assets of U.S. forces in combat. The center was organized there in 2005. Creech also is the training ground for the MQ-1B Predator, the unmanned aircraft used heavily in combat for both attack and reconnaissance. Since becoming chairman in October, Mullen has traveled frequently to military bases worldwide, hosting candid meetings in which he allows service members to ask questions and voice opinions. He has faced tough questions about combat tour lengths, dwell time at home stations between deployments, and other family support issues. He also frequently visits wounded warrior treatment facilities. The TNT has a piece on the memorial the town of Enumclaw hopes to build to honor Fort Lewis pilots killed near there in 2006. The Poop Report (no joke) has the skinny on the Special Olympics team not too thrilled with the open bay of toilets in the Fort Lewis barracks where they stayed. The relationship between servicemembers and their coffee is so storied that the hot black liquid has a role in nearly every war movie ever made. With a desire to support the troops and an understanding of that relationship, the mother and daughter team of Tamra Gravitt and Crystal Espiritu started GI Java. The coffee shop serves its brew to each customer with honor, integrity and excellence above the call of duty, according to a news release from the coffee shop. The company, with five locations in Washington state, offers coffee in military-themed sizes: the small is called a private, and the large is a sergeant. A portion of all sales goes to U.S. Wounded Soldiers Foundation, and donations for the foundation are accepted in all five shops. U.S. Wounded Soldiers Foundation provides for the needs of servicemembers wounded while serving in Iraq and Afghanistan. The foundation is a supporter of America Supports You, a Defense Department program connecting citizens and companies with servicemembers and their families serving at home and abroad. Here is the Seattle Times' report on the boating accident on the Nisqualy last week that claimed the lives of a deployed soldier's children.